As we pull back the curtain from the European version of history, we discover the vast depth of knowledge of our ancient ancestors--knowledge that not only dispels our image of them as primitive peoples but also corresponds with the forefront of modern science, philosophy, and spirituality. With contributions by David Frawley, Geoff Stray, Joscelyn Godwin, Daniel Pinchbeck, Antoine Gigal, and other provocative, cutting-edge thinkers, this collection of essays commissioned by Graham Hancock, bestselling author of Fingerprints of the Gods, represents the latest, often controversial findings in alternative science, history, archaeology, and consciousness research. 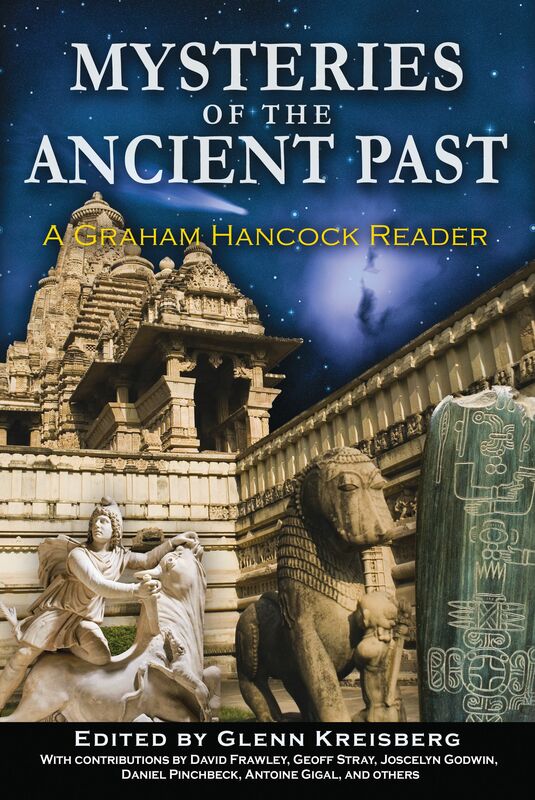 Covering topics ranging from the origins of the Inca and the secrets hidden in Vedic literature, to the architecture of the Giza pyramids and the Sphinx, to unified theories of physics and consciousness, this book shows how, by recovering our lost history, we too can experience the higher consciousness and advanced wisdom of the ancients. At the southern tip of Africa, equidistant from the Indian Ocean and the Atlantic, lies a high plateau known as the Great Karoo. On the distant horizon, flat-topped hills--“koppies”--of sandstone and shale resemble the mesas of my home territory in the southwestern United States. Dark dolerite outcroppings strewn with mineral-stained, igneous boulders were perfect for carving petroglyphs, or, as they call them in South Africa, rock engravings. In September of 2009, I had the opportunity to travel there to assist my colleague Rob Milne with his rock art research. We visited a site called Driekopseiland, an Afrikaans name meaning “three hills island.” It is located on a working farm along the Riet River near the city of Kimberley in the Northern Cape province. Little did I expect to encounter images in stone that resembled the star beings carved by the ancient Hopi Indians of Arizona. Every foot or so we came across some bewildering design deeply carved into a plane of stone so smooth it almost looked polished. These labor-intensive markings were no idle doodling to wile away a hot afternoon. Andesite is a fairly hard mineral and is rated 6 on the Mohs scale. Granite is a bit harder at 6.5, and quartz is only 7. Diamond is the hardest mineral and rates 10 on the scale; mined for thousands of years not far from here, the holy “Stones of the Sun” were most likely used to carve this hard rock. But what is the meaning of these enigmatic dream-symbols carved into the bedrock? David Lewis-Williams, cognitive archaeologist and specialist in South African rock art, says that these engravings were not merely representations of the natural world or abstractions of inner space. Instead, they were “windows on other worlds”--veils between the physical world and the spirit world. Some of the most puzzling engravings that we found depicted humanoids with some sort of bizarre paraphernalia. What Rob Milne has dubbed “the Spaceman” is located adjacent to “the flying saucer” and “the rocket.” The protrusion from this figure’s helmet is somewhat similar to the cone-shaped nose on a Hopi kachina, or spirit messenger. Credo Mutwa claims that creatures from a star in Orion once lived in pre-human times on Earth and built a huge subterranean metropolis in the heart of Africa. Before human beings were created on this planet, there had existed a very wise race of people known as the Imanyukela. These people had come from the constellation known to white people as Orion, and they had inhabited our earth for thousands and thousands of years. And that before they had left our earth to return once more to the sacred Spider constellation, they made a great evacuation under the earth, beneath the Ruwensory [Rwenzori] Mountains--the Mountains of the Moon. One petroglyph ostensibly looked like a sun symbol, with rays emanating from the circle. Later I obtained a picture of NASA’s Pioneer Plaque and compared it with the engraving with the radial pattern. There are seven rays in each hemisphere of the circle, corresponding to the pulsars. At the upper right is a circle that contains two lines, corresponding to the hydrogen molecule on the plaque. The outer circle may contain 33 rays, but it is impossible to tell because the rock surface is flaked to the immediate right of the circle. The 6" × 9" gold-anodized aluminum plaque shows the position of the sun with respect to the center of the galaxy and nearby pulsars. Carl Sagan and Frank Drake created it in an attempt to communicate with extraterrestrial life somewhere in the far reaches of outer space. Launched in 1972, Pioneer 10 and Pioneer 11 were the first spacecraft designed to leave the solar system, and both carry duplicates of the plaque. It displays the then nine planets, including Pluto. It also shows the Pioneer spacecraft’s planet of origin, its trajectory past Mars and Jupiter, and its slingshot past Saturn outward from our helio-heart. The radial pattern consists of fourteen lines made up of long binary numbers that represent the periods of the pulsars. The horizontal line that extends past the humans represents the sun’s relative distance to the center of the galaxy. A silhouette of the spacecraft in scale is juxtaposed to the humans so that relative size can be determined. The two circles at the top represent the fundamental state of the hydrogen atom, which acts as a universal clock. The regular decrease in the frequency of the pulsars will enable ETs to determine the time elapsed since each spacecraft was launched. In about two million years the plaque should arrive at Aldebaran, sixty-eight light-years away. Did the people who made this South African rock engraving perhaps thousands of years ago actually “remote view” the future and glimpse this image we created in the late twentieth century, which is now bound for the stars? Were they in contact with an intelligence that knew about the Pioneer Plaque from their journeys through space-time and wanted to convey its significance to Indigenous tribes? Or is this all just a big coincidence?